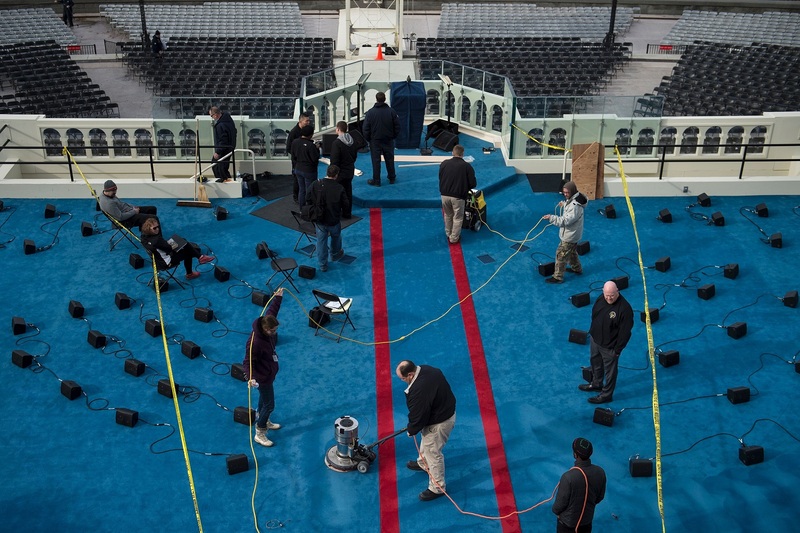 Workers clean the carpet on the inauguration platform in preparation for tomorrow’s U.S. Presidential Inauguration on Capitol Hill, in Washington, D.C., January 19, 2017. This podcast was produced by the Carnegie–Tsinghua Center for Global Policy. As U.S. President-elect Donald Trump’s inauguration approaches, uncertainty looms over the future of U.S.-China policy. In part one of this two-part podcast, Paul Haenle speaks with Chen Dingding, an International Relations professor at Jinan University and Founding Director of the Intellisia Institute, about the Chinese reaction to Trump’s election and his views on how it could impact future bilateral relations. Ahead of the November elections, Chen predicted not only that Trump would win the election, but also that he would do it with at least 286 electoral college votes, that a Rust Belt blue state would flip to red, and that Congress would stay in Republican control. Chen said he reached these conclusions by paying attention to the “silent voter” phenomenon in the Midwest and the tremendous support Trump received in rural areas. When it comes to Trump’s inauguration rhetoric and tweets, Chen expressed concern that Trump is sending confusing signals that could cause instability and divert current discussions on issues involving the United States and China. An emerging consensus remains to be seen, Chen said, on whether Donald Trump will be very good, or very bad, for U.S.-China relations.